Jacqueline and her husband Joseph moved onto their biodynamic farm in southwest Washington in 2001 and she got her first hives soon after. She attended conventional bee school and immediately knew there must be a different way to care for bees that is more respectful, more compassionate, more like the way feral bees live. A few years later she began teaching this bee-centric approach in her classes, blending natural beekeeping and bee-driven insights into the nature of bees. 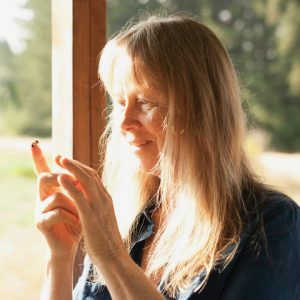 She speaks and teaches about bees at events including the Organic Beekeepers Conference, NW Permaculture, Women’s Permaculture Conference, Women in Agriculture. She’s written magazine articles for Biodynamics, Lilipoh, Home Orchard Society, Living in the Northwest, a chapter for the Queen of the Sun book, and appeared as the gentle swarm-mover in the documentary “Queen of the Sun.” In 2013 she was invited by the Dominican Republic to work with rural beekeepers to help them learn organic and biodynamic methods to care for their bees. In her life-before-bees. she founded a holistic health center and a women’s crisis center. For a dozen years she was on faculty for a Structural Integration school. In 2003 she and her husband Joseph started a school of Equine Structural Integration. In early 2015 her bee book, “The Song of Increase: Returning to our Sacred Partnership with Honeybees,” was published. More to come! Recording bees allows Robin to engage in one of her favorite activities–field recording. She is blessed that the bees allow her to record and photograph them on an intimate level. She shares with Jacqueline a devotion to protecting bees. Her bee audio and photographs express this deeply felt commitment. Robin Wise’s interest in bees was sparked by the images of hieroglyphs of bee culture dating to pre-dynastic Egyptian times. While attending one of Jacqueline’s bee classes, Robin resonated to Jacqueline’s unique perspective about the bees. Robin offered her professional services to work with Jacqueline to help get this bee knowledge out into the world. Robin, who keeps bees at her home in Portland, Oregon, documents bee life through audio and photography. Robin has worked as a professional audio engineer for over 20 years. Prior to this career, Robin taught music in public schools and was an award-winning ensemble conductor. Her love of the intricate details of music drew her to work with other sounds in a similar way. Currently she is a Technical Director and Mix Engineer for public radio documentaries. She is known for incorporating sound as a story telling element. Projects she has worked on have won numerous major awards, including The Peabody Award, Robert Woods Johnson Award, Silver Baton of the Alfred I. duPont-Columbia Award, AAAS Award, and the Robert F. Kennedy Journalism Award. Robin has also prepared audio books for Simon and Schuster Audio. Authors include Dr. Stephen Covey, Dr. Phil, and Gary Zukav. She also mixed “The Secret” by Ronda Byrne, which is the all-time highest selling audio book. Always a teacher, Robin has taught digital audio technology at the Graduate School of Journalism at UC Berkeley, the United Nations, AARP, and to countless independent audio and film producers. 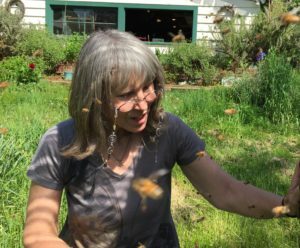 This past spring Susan helped re-home ten swarms of bees that tumbled out — over a period of three weeks — from two of her backyard hives. Teacher, master storyteller, and author of the classic New York Times Bestseller, “Animals as Teachers and Healers,” Susan Chernak McElroy’s writings are published in more than twenty languages worldwide. She is a nationally recognized, passionate, and original voice on the subject of our emotional, biological, and sacred relationships with animals and wild nature. Four years ago, Susan met Jacqueline. It was a match made in bee-heaven. Jacqueline opened Susan up to the sacred world of the honeybee, and Susan helped Jacqueline put all of her bee-centered wisdom into her book. Susan tends six hives in her backyard these days — top bars and Warres — and teaches Spiritbee’s beginning beekeeping classes. Susan’s hives are the focus of her spiritual practice—the apiary as temple, teacher, divine inspiration, and meditation corner. She continues to study the science and the mystery of beekeeping, and believes that what is truly good for honeybees is equally good for human bee-ings. 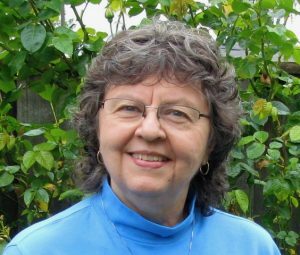 A dynamic and gifted presenter, Susan is a powerful catalyst for personal growth and change. A long term-survivor of advanced cancer, She speaks from a rich body of lived experience, reminding us that our evolutionary journey toward becoming more fully human beings has included thousands of years of intimate connection with honeybees, animals, and the living Earth.